"Epic destiny unfolds around a girl with no name. A girl known as Neven." 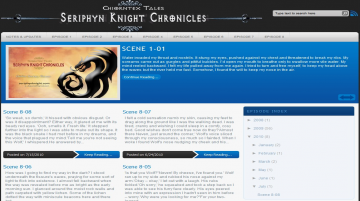 The Seriphyn Knight Chronicles is a web fiction series focused on the self discovery of a young girl and her involvement with dark magic, ancient legends and myths. Season One Blurb below: The year is the 167th reign of the Great Emperor Leinard. You have stepped into a realm where magic is everywhere and anything is possible. At the heart of it all is a young girl named Neven. It hasn’t been easy for Neven: she nearly drowned, suffered slavery and now she must help four men locate magical doors known only as Tsazcuths. Oh the power festering behind those doors! It’s getting ugly. Want to see how she goes? Begin the journey to find out. Seriphyn Knight Chronicles has not been reviewed yet. Seriphyn Knight Chronicles has not been recommended yet.